It’s the most at home you will ever feel when away from home during a romantic escape or small family getaway to the Smoky Mountains and Pigeon Forge. 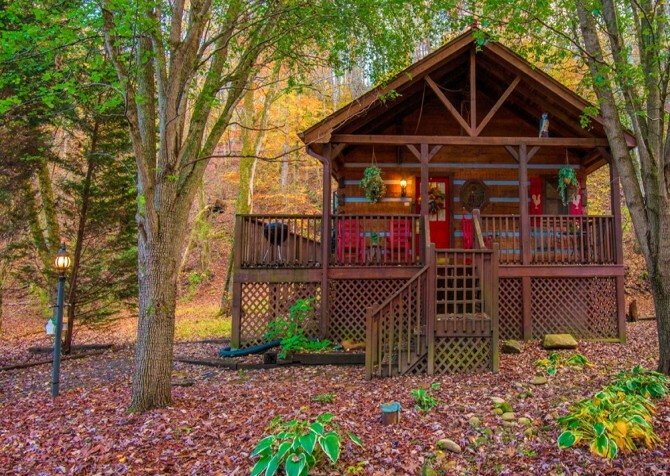 This absolutely charming cottage in the woods boasts a picturesque front yard, a wraparound deck with lush wooded views, and a warm, inviting cabin atmosphere inside. 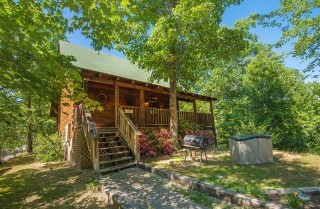 With accommodations for up to 4 guests to comfortably sleep, eat, and play in the open-concept spaces, your small family vacation will find a perfect destination in A Smoky Mountain Rose, while honeymoons, anniversaries, and relaxing escapes will have ample room in the cozy bedroom with a king-size bed. Fall in love all over again with romantic dinners made in the fully loaded kitchen before settling into the plush couch to cuddle in front of a fire in the stacked-stone fireplace. Under 5 miles from downtown Pigeon Forge, relaxation and exciting adventures provide the perfect balance to any vacation in the Smokies. 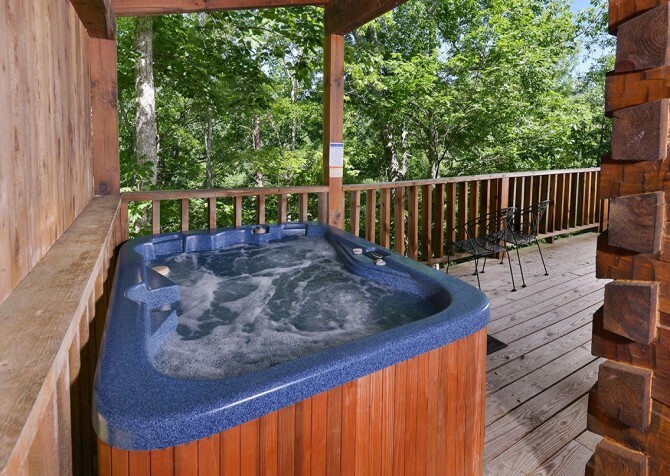 After scenic hikes and bike rides in Cades Cove, soothe tired muscles in the large indoor jetted tub or the bubbly waters of the outdoor hot tub. 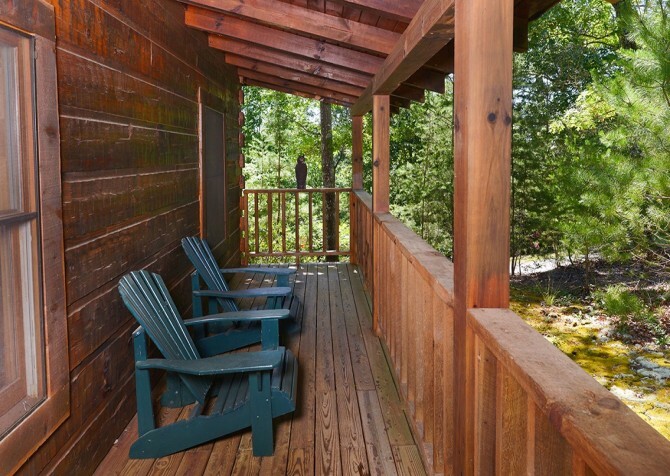 Pick up the perfect bottle of wine from the Mountain Valley Winery to toast an anniversary while seated on the deck after a delicious meal at The Peddler Steakhouse on the Little Pigeon River. 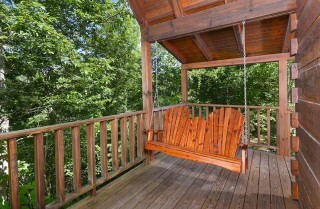 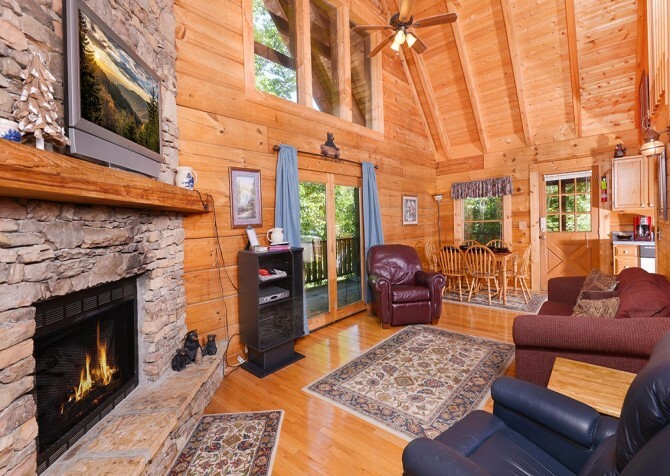 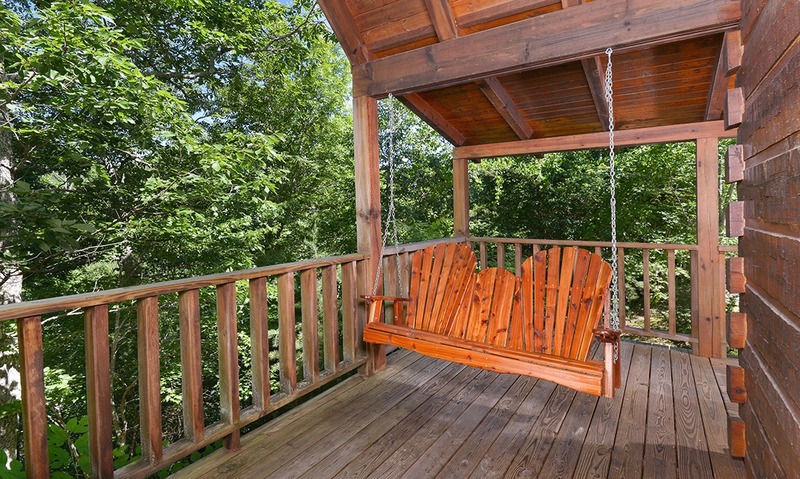 With all the comforts of home, fun amenities like a pool table and large flatscreen TV to watch movies by the fire, and the convenience of nearby Pigeon Forge, A Smoky Mountain Rose is a lovely find among the Smoky Mountain forestry. Centered around a gorgeous stacked-stone fireplace, gather around and sink into the plush couch and leather armchairs after fruitful morning shopping trips in the Old Mill District, the Tanger Outlets of Sevierville, and the Great Smoky Arts & Crafts Community. 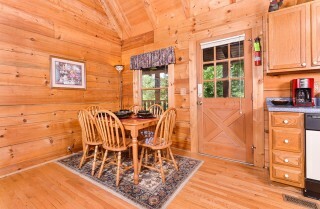 Read your favorite book in the cozy red armchair by the glass doors where soft lighting drifts in on sunny afternoons. 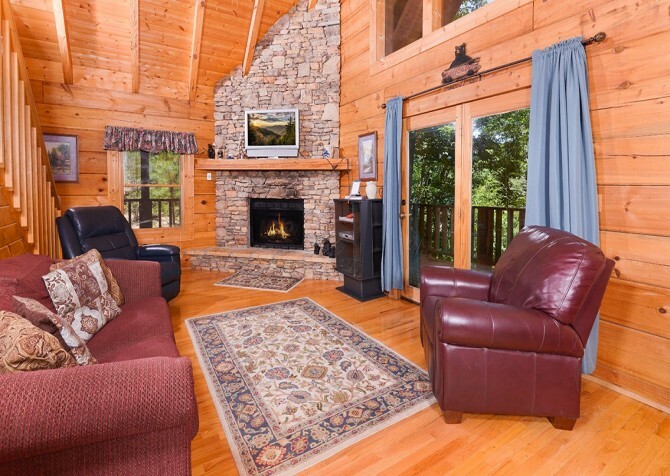 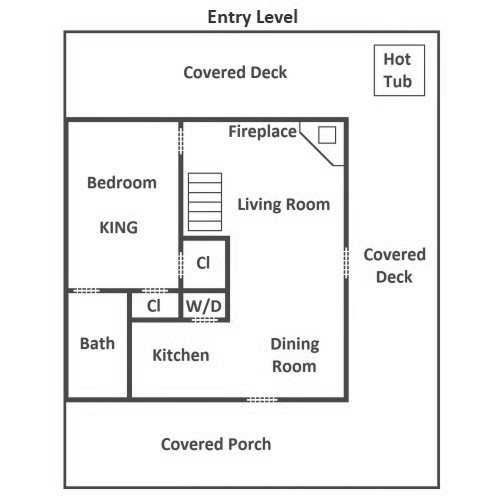 Light a fire in the gas fireplace with ease on those cool Smoky Mountain nights and cuddle on the sofa while watching your favorite DVD movies from home on the large flatscreen TV on the mantel. 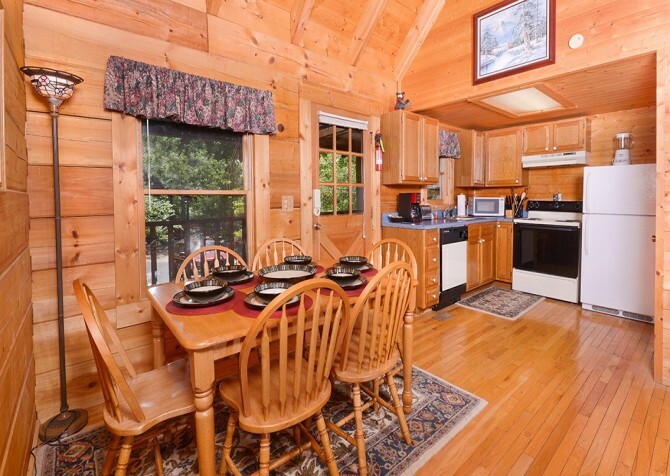 Charming blue countertops paired with natural wood tones create a homey kitchen setting where you will love preparing multi-course romantic dinners, quick lunches before nights in downtown Pigeon Forge, and little snacks when those midnight cravings hit. 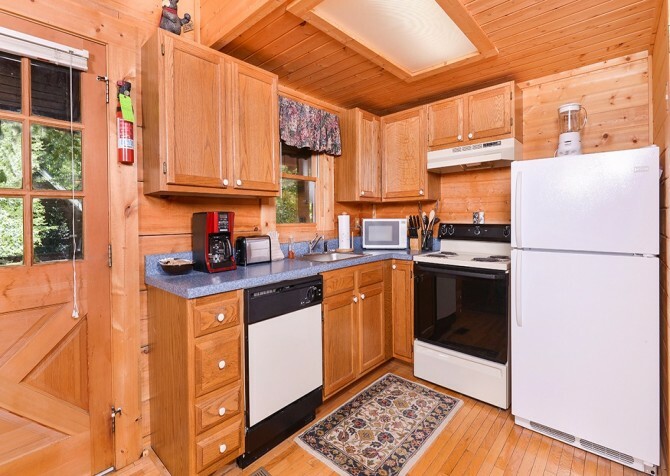 With every tool and appliance at your fingertips, saving money and cooking in the cabin is easy and lends you a little extra cash for souvenirs. Put together breakfast in no time with a toaster, coffeemaker, and microwave at your fingertips. 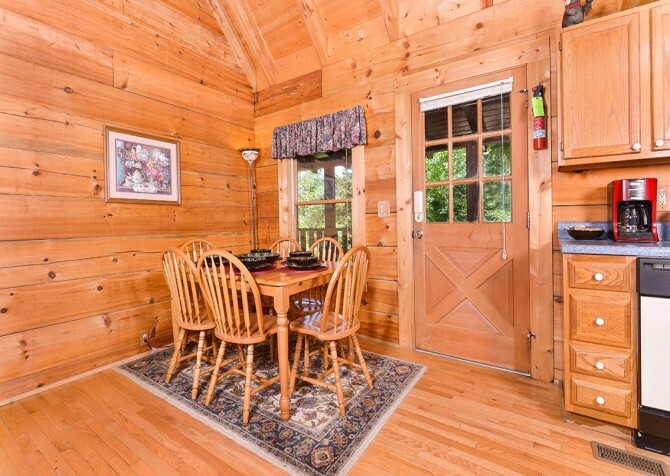 Along with cooking tools, pots, and pans, you’ll discover a lovely dining set in the kitchen cupboards to set your charming wood dining table for delicious meals deserving of better than paper and plastic plates. Enjoy breakfast in the soft morning light drifting in through the nearby window while setting the mood for romantic dinners with the mosaic free-standing lamp. Once you have eaten your fill, place plates and utensils in the convenient dishwasher for a quick and easy cleanup before setting the table with your favorite board games from home. 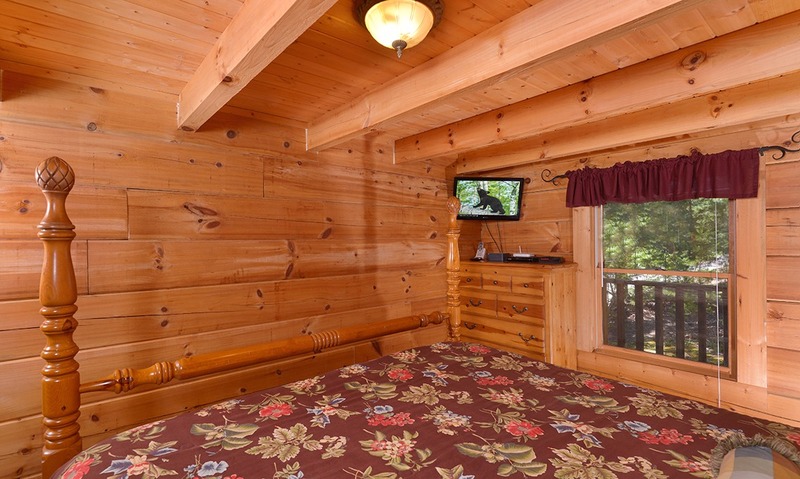 As if the plush king-size bed is not enough to make you feel right at home, the master suite boasts a flatscreen TV, direct bathroom access, and space to unpack your suitcases. 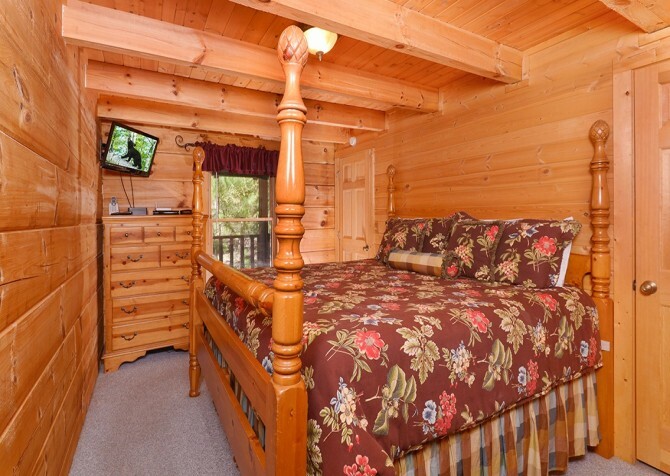 The inviting atmosphere of your bedroom lends ample rest and relaxation while napping under the breeze of the ceiling fan and kicking back with a little TV before bedtime. With restful nights of sleep each evening under the quilted covers, you will be fully prepared for long, adventurous days exploring the Smoky Mountains and surrounding cities. Upstairs, the loft rec room provides ample fun and relaxation while overlooking an open-air balcony and loft windows filled with Smoky Mountain forest scenery. 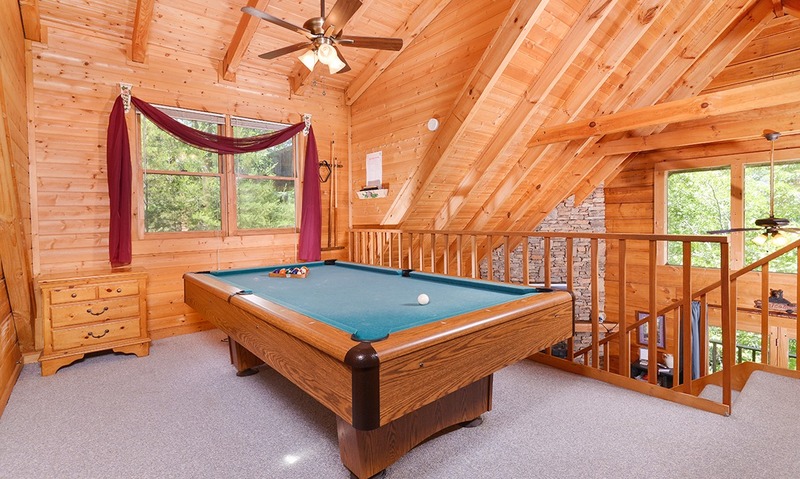 Shoot some pool at the end of the night while sipping on your favorite beers from the Smoky Mountain Brewery or practice those shots you have never been able to make between excursions into downtown Pigeon Forge. 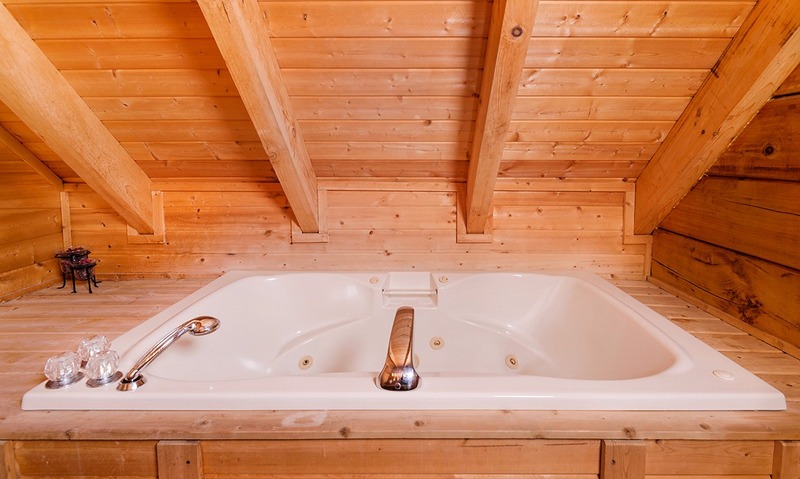 End each evening of your stay with soothing baths in the large indoor jetted tub complete with a detachable showerhead for easier rinsing before throwing on a robe and cuddling by a fire in the living room. A smooth, flat driveway and walkway lead you up through the charming front yard before coming up the stairs to the wraparound covered porch. With lush forestry to soothe your mind, spend quiet morning swaying in the porch swing or savoring every sip of your morning coffee in a chair. Let the soft, dreamy light of dusk fade into the dark night sky while you unwind in the soothing, bubbly waters of the outdoor hot tub for the ultimate relaxation each evening. Take advantage of pretty days under the shade of the trees with outdoor cookouts on the charcoal grill, sipping on ice cold sweet tea in between flipping burgers or steaks. 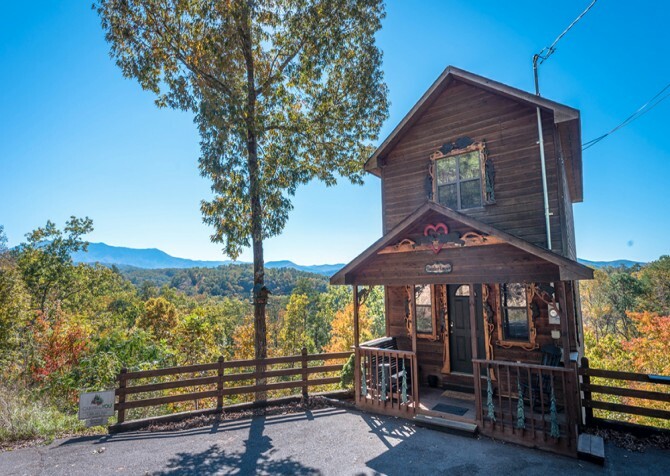 Come experience 1890s-style theater in the heart of downtown Gatlinburg, the longest running theater company in the Smoky Mountains, where tons of laughs and excitement is sure to ensue in all their original shows with professional actors. 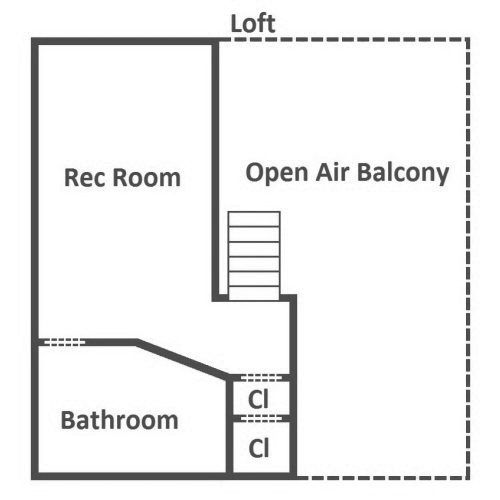 But watch out, they recruit some amateurs from the audience! Overlooking their expansive apple orchard, this charming cider barn, winery, and general store boasts home-grown, mouthwatering apples that go into their numerous apple-inspired drinks, treats, and more! 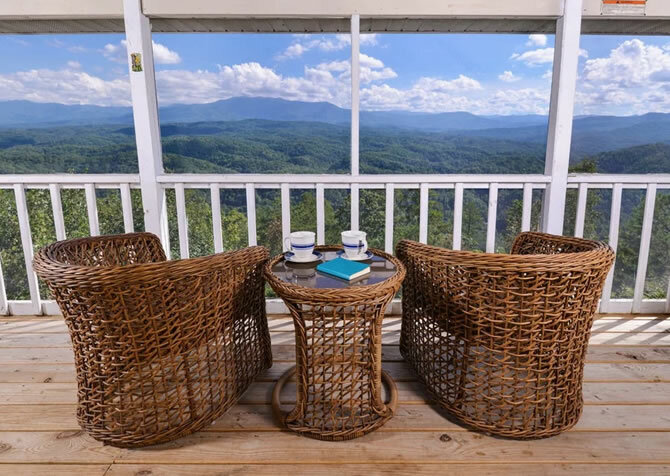 Take a seat in a rocking chair and spend lovely afternoon sipping on fresh apple ciders while taking in beautiful views in Sevierville, Tennessee. 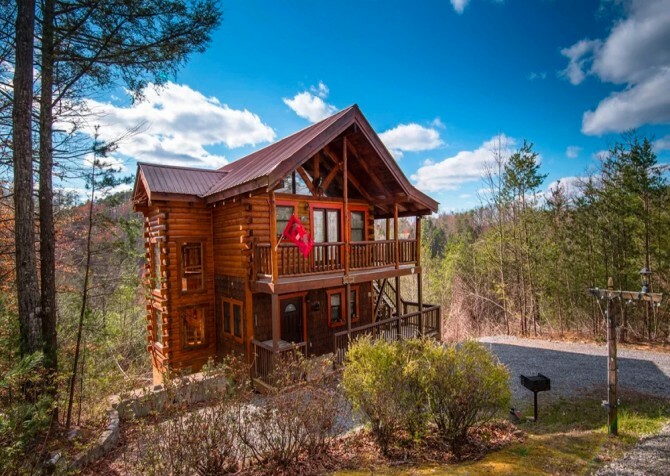 It’s the most exciting single-car roller coaster in the Smokies as you wind, zip, and drop down the mountainside as fast or as slow as you would like to go! Be sure to come back after sundown when the entire track is traced by bright neon lights through the forestry. 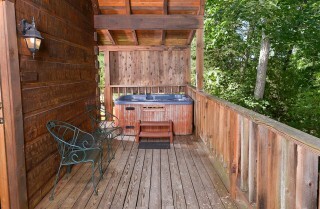 "Cabins for You was very helpful, and our cabin, A Secret Romance, was perfect for our honeymoon! 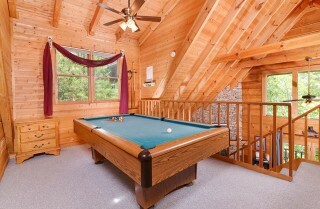 It was so clean and nice. 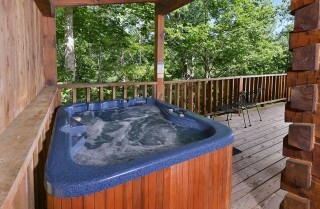 I highly suggest them for your mountain getaway." 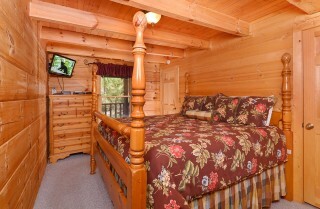 "I was very impressed with our cabin. It was very clean, well kept and well stocked with supplies. 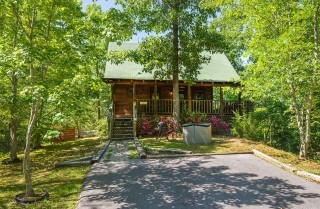 We enjoyed our cabin so much we didn't leave much and wished we booked for longer than 2 days. 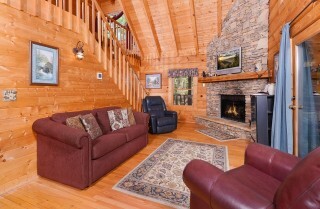 The staff was very friendly and professional also."